The entertainment capital of the world aka Sin City aka City of Lost Wages. Each of these monikers belongs to the metropolis with an energy bill so high that it’s partially subsidized. 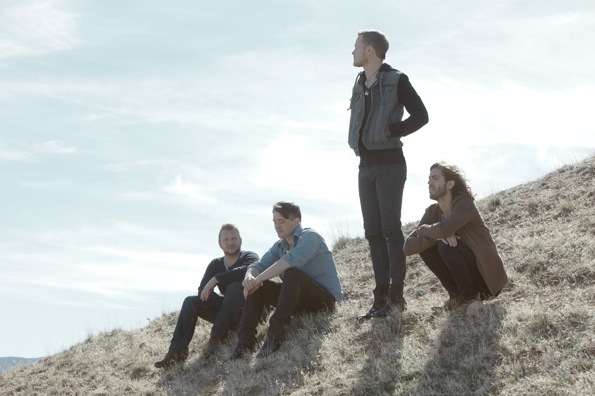 Yeah, we’re talking about Las Vegas, boys and girls; home base for Imagine Dragons. Hey, what’s with that name: Imagine Dragons? We don’t know and perhaps 15 years from now after someone has plied Dan Reynolds (vocals, keys), Wayne Sermon (guitar), Ben McKee (bass, keys), or Daniel Platzman (drums) with a sufficient amount of liquid libations, one of them will let the secret of that particular anagram slip, but until then, keep your eyes and ears tuned on this foursome who have found a musical place in the sun due to their penchant for creating synth-laced, rhythm-centric rock with a shiny layer of pop-gems that run the emotional gamut — hitting listeners right in the pocket somewhere between heart-swelling anthemic and get your dance on. It sounds like a night on the Vegas Strip where you go for broke with all your heart because not even trying is just not an option. The voice that carries the weight and soul of Imagine Dragons’ songs is a strong, rich tenor and when Reynolds bellows, “Can nobody hear me?” it’s got to be a rhetorical question. They’ve landed on Interscope Records and with the release of their third EP Continued Silence (more questionable wording, but we love them so we’ll let that paradox slide), they’ve made their first appearance on a Billboard chart, debuting at #165 on the Billboard 200. Don’t look now, but their single “It’s Time” has taken up residence at Billboard: #6 on Alternative Songs, #93 on the Hot 100, and #11 on Rock Songs. Now if you’ve ever seen an Imagine Dragons show, then you know that the band is no delicate performance-flower: they put out. Energy. Emotion. Love. Wait, what did you think I meant? Moving on. Powerful live versions of songs like “All Eyes” and “Cover Up” from their earlier EPs are the stuff that helped build a durable connective tissue between this band and their audience. According to the Chinese calendar, 2012 is the Year of the Dragon. Not kidding. This year finds Imagine Dragons being road warriors from SXSW to their crazy summer festival schedule to an upcoming Fall tour with AWOLNATION, and the song title “It’s Time” could not be more apropos. In its original recorded form, it’s a self-affirming statement of a song to be sung way out loud and with every ounce of feeling one can muster. But even when the band pulls back and softens it with intimacy, it’s no less stirring. So feel free to sing along: You know you want to.